Michael Lapsley, an Anglican priest born in New Zealand, was sent to South Africa at age 24. There he discovered the terrible reality that was Apartheid. Appalled by racial segregation so contrary to his pacifist and evangelical values, he quickly became involved in the struggle for freedom. He went as far as accepting to become the ANC’s chaplain, a position which exposed him to every danger. As a white priest, his brave words and natural charism made him a marked man. Because of the death threats he received, he went into exile in Lesotho and later in Zimbabwe. This, however, did not impede him from working for a more equal society. In that country, on April 28, 1990, he lost both hands, an eardrum and an eye in a parcel-bomb attack. From that time, he was forced to live with a severe handicap – with hooks instead of hands and in need of assistance on a daily basis. He lived through a period of terrible pain and numerous surgical procedures. Yet, as he himself explains, he evolved from victim, to survivor, to victor. When the Apartheid regime fell, Michael Lapsley returned to South Africa and participated alongside his friend, Archbishop Desmond Tutu, in the Truth and Reconciliation Commission. He was asked to contribute to the Centre for Victims of Violence and Torture. He understood that, in order to attain peace, a vast undertaking of reconciliation was necessary. In 1998, he founded the Institute for Healing Memories (www.healing-memories.org) in which he has been involved with vitality and conviction ever since. Now at 65, he travels the world as an agent of reconciliation and peace. He facilitates healing memories workshops among inmates, refugees and the sick in numerous countries on every continent. His experience enables him to relate to those most wounded. Never one to be prone to discouragement, he managed to extricate himself from his ordeal with a strength which stemmed from humility and compassion. His autobiography, Redeeming the Past, My Journey from Freedom Fighter to Healer, has been translated into several languages. LAPSLEY, Michael, Redeeming the Past, My Journey from Freedom Fighter to Healer. With Stephen Karakashian, New York, Orbis Books, 2012.
http://www.healing-memories.org/ Three videos that explore the stages of healing. The Story of Father Michael Lapsley and the Founding of the Institute for Healing Memories. Video produced, directed and edited by Melvin McCray, 2014. Duration 15:49. https://www.youtube.com/watch?v=muJgx0TO48s in English with French subtitles. https://www.youtube.com/watch?v=DZJPkHWYmBc in English with Spanish subtiltes (La historia de Michael Lapsley y la fundación para la reconciliación). To support this nomination for the Public Peace Prize, post a comment indicating the reasons why you would like this person to receive this distinction. Each comment will be worth three votes for this candidate. during his speaking tour this past summer. I heartily agree that Michael Lapsley would be a super candidate for this prize. I would like to recommend Michael Lapsley as a candidate for the Peace prize. Michael’s unflinching commitment to peace and reconciliation has encouraged thousands of people to find hope amidst their own tragedies. For those working at peace and reconciliation, his life story has encouraged us not to give up no matter how bleak the situation might seem. His testimony at Christ Church Cathedral this summer was a powerful witness to the community that the darkness will not prevail as long as each one of us continues to seek to bring peace to our hurting world. His humility, as well as his unpretentious manner, reminded us that the greatness of a man is not measured by power but by the lives of people touched. It is with great pleasure that I recommend this recognition for a man who has done so much for the message of peace in the world. I wish to register my support for the nomination of Fr. Michael Lapsley for the 2016 Public Peace Prize. Listening to his story, his personal testimony and listening to those he has helped to deal with trauma has helped me overcome my own personal difficulties and realise that it is possible to achieve global peace with understanding and forgiveness. The realistic approach he takes, and the evidence of his work among communities he has worked with globally has convinced me to advocate for his work through the Institute for the Healing of Memories globally. Supporting his nomination for the award is my humble acknowledgement of the monumental work Fr. Michael Lapsley is engaged in in the Healing of Memories. To continue to fight for peace and justice after such injuries seems to me something special. I support the nomination of Michael Lapsley. I had the privilege of listening to him when he spoke at St. Ethelburga’s in London. His humble thought provoking witness for peace and nonviolence is powerful. Michael Lapsley has worked tirelessly in many different countries to support and help people overcome situations that have affected their physical and mental states. Lapsley works on healing memories He speaks from the heart, and from experience, to everyone. I have had the priviledge and joy of listening to him speak and then talking to him. Unconditional love and wisdom permeate his being. Fr Michael’s humility and grace, stands as a living declaration that disfigurement is not an inevitable outcome for those subjected to violence and hatred. In my humble opinion you could select no finer recipient for the 2016 Public Peace Prize than Father Michael Lapsley. This gentle, intelligent, articulate, grace-filled servant of God’s love and hope for this world has a story that reaches into hearts, lodges and stays there. I was one fortunate participant in the first Healing of Memories Workshop to be held outside South Africa when Father Michael came to NY and led the event at The Riverside Church. I will never forget it. His words flow like a cool mountain stream. And we discover that we are all ambassadors on the road to peace. Everyone has been hurt. Everyone, intentionally or not, has contributed to the hurts of the world. And all are healing. All are on the journey. His ministry is deep, profound, local and global. I support the nomination of Father Michael Lapsley for this honor with my whole heart. Thank you. I have known Michael’s work through his visits home to New Zealand. He is doing real reconciliation work. His courses address deep healing in a world that needs it badly. I am very happy to vote for him. When Michael Lapsley was nearly assassinated in 1990 by a package bomb in Harare I was called to be his initial Physician/Surgeon.. I can confirm that he survived that horrendous trams with remarkable grace and quiet composure He is truly an outstanding person, and has shown, since that terrible time, a dedication to being of service to other victims of violence. Michael is truly worthy of this Award’s Recognition. I strongly recommend Fr Michael Lapsley because he is a man who in the name of God has given the world an opportunity to talk about reconciliation from a practical point of view. May his work continue to challenge the world into the future. When Christians pray “Thy kingdom (of peace and love and joy for all) come”, Fr. Michael shows us how that could be accomplish right here and now. What an appropriate recipient of such an award as this. I first met Fr Michael SSM when he stayed at my home in Dar es Salaam in the 1970s after he had been banned from South Africa and had joined the ANC. We have remained in intermittent contact over the decades since then, especially during his visits to family in New Zealand when he would always be happy to accept public speaking engagements to speak for reconciliation in South Africa (and in the many other places where his ministry has taken him). It is a wonderful miracle that from the despair of the victim of the 1990 letter-bomb, Michael has become a powerful advocate for peace and healing in a world that desperately needs both. He thoroughly deserves the accolade of thePublic Peace Prize. I vividly remember visiting Michael in a Sydney hospital where he was recovering from the horrendous injuries inflicted on him because of his unremitting stand for justice and peace in South Africa. Weak and extremely physically handicapped, his heart and mind were focused even then on how he could continue the work of reconciliation and healing and encourage others to do likewise. His life is an inspiration and I whole-heartedly support his nomination for the Peace Prize. I had the privilege of attending a Healing of memories workshop some years ago. the nomination of Fr Lapsley for the Peace Prize. I am pleased to recommend Father Lapsley as a worthy recipient of the peace prize. Father Michael Lapsley is a wounded healer who brings hope to people captured in pain and suffering in post-conflict areas around the world. To me he is a man of great inspiration. I am happy to vote for him! I wish to also join in support of the nomination of Fr Lapsley, who for me has been beacon of hope and strength for all those whose freedom is under siege. The world, and South Africa in particular needs healing from its past; who is better in championing this cause. Father Michael is doing a tremendous job, not only by his wisdom and words but also by his deeds and humility. I therefore support the nomination of Father Michael Lapsley for the Public Peace Prize. I have the privilege of both a professional relationship and a personal friendship with Fr Michael and I cannot think of a more appropriate or deserving recipient of such a prize as the Public Peace Prize. Michael is an inspiration to all people in how true peace can be realised. I commend him to all for this award. Father lapsley spoke in asheville, NC at our worship. He spoke with great compassion and love for his people. He also has a wonderful sense of humor. He is, indeed, a great peacemaker. I wholeheartedly support Michael Lapsley’s nomination for this peace prize. He has been an inspiration in his work for reconciliation and the healing of memories, embodying in his own life the possibility of responding to adversity by peaceful means. I grew up in South Africa in the apartheid era and am grateful for Michael’s perseverance through difficult times, in his own country and across the world, to building bridges of peace and demonstrating an alternative lifestyle to that of conflict and violence. Mr. Lapsley has not only accomplished amazing things himself, he has also inspired many others to do their own good works. His ripple effect has tremendous magnitude. Father Michel has been an example of defender of just causes, the redemption, sensitivity, simplicity and humanity. We will always remember for its adherence and responsiveness to the cause of the Cuban Five and the unconditional support given to the Cuban hero Gerardo Hernández today. El padre Lapsley es un gran hombre, lleno de amor por la humanidad y por la paz. La nobleza con que se ha enfrentado al odio que se vertió sobre él, de la manera más cruel, habla de su carácter y principios. Cualquier premio será dignificado cayendo sobre el padre Lapsley. Quienes hemos tenido el privilegio de beneficiarnos de su afecto siempre lo tendremos entre los amigos que nos honran. Un abrazo al hombre de la eterna sonrisa y el optimismo a toda prueba. Bien merecido honor. El premio se verá honrado con el nombre de Michael Lapsley entre sus galardonados. My support without any doubt goes to Father Lapseley. His contribution towards restoring Humanity and peace across the world is to be admired. The world at this point and time desperately needs peace and humanity. I vote for Father MIchael. A fighter for justice and humanity that has devoted his life to the struggle for a better world. I would like to nominate Michael Lapsley for the Public Peace Prize. I have known Michael for over 40 years and it has always been an honour to consider him part of our family. His dedication and commitment to his life’s work of helping others and encouraging peace & reconciliation in this world is truly remarkable. Michael is respected, admired and loved by all. A worthy recipient. I am honored to recommend Father Michael Lapsley as a candidate for the Peace prize. He has brought peace and reconciliation to so many who have suffered the terrible effects of violence and conflict throughout the world . His personal story is an inspiration to us all. I would like to nominate Michael Lapsley for the Public Peace Prize because of his fearless dedication to peace and reconciliation both during the Apartheid era and after, continuing to this present time. He has turned a shocking attack on his life around and has triumphantly worked among hundreds of people to promote healing and wholeness in their broken lives. I cast my vote for Father Michael Lapsley to receive this well-deserved honor. It was inspirational to hear Father Michael speak a few years ago. His lack of bitterness was truly remarkable. A great Christian witness. Father Michael embodies the highest vibration of compassion energy positively charging and regulating all space he enters and beings he comes in contact with. If this award opens opportunity to accelerate this process then it should be immediately handed over. I may not know Fr Micheal personally but his story is that of true bravery and heroism. That of love,acceptance,transformation,kindness and healing. He inspires me to be a better person, a better member of a society without racial divides but one common goal of healing and love and peace. He is fully deserving of this recognition and has my support. Fr. Michael’s life work lies at the very intersection of some of the critical questions of our time. What is healing? What is the role of memory? of faith? Should we forgive? and can forgiveness be reconciled with the struggle for justice? These are questions perhaps best addressed, not so much didactically, but by lived example. Many years ago Fr. Michael’s survived a letter bomb sent by the South African apartheid government that was intent on killing him. Instead of retreating into victimhood, and propelled by a deep love for the human family, he has embarked on a healing ministry to the far corners of the earth where others are similarly coping with trauma and despair. He touches them with skill and gentleness, but perhaps his most important instrument of healing is embodied in his very life. When our stories are told…and listened to…….there is a strange wonder that comes in the peace it brings. In the perceiving of that peace a door seems to open and to allow healing to enter in, to begin the journey towards reconciliation and restoration . Thus it is that Michael Lapsley has, through his compassion and understanding brought many to the door, and on to equipping them /us with the courage to turn the handle and go through. This is his precious gift which he has so generously spread abroad. He is indeed a worthy candidate for the prize of peacemaker. 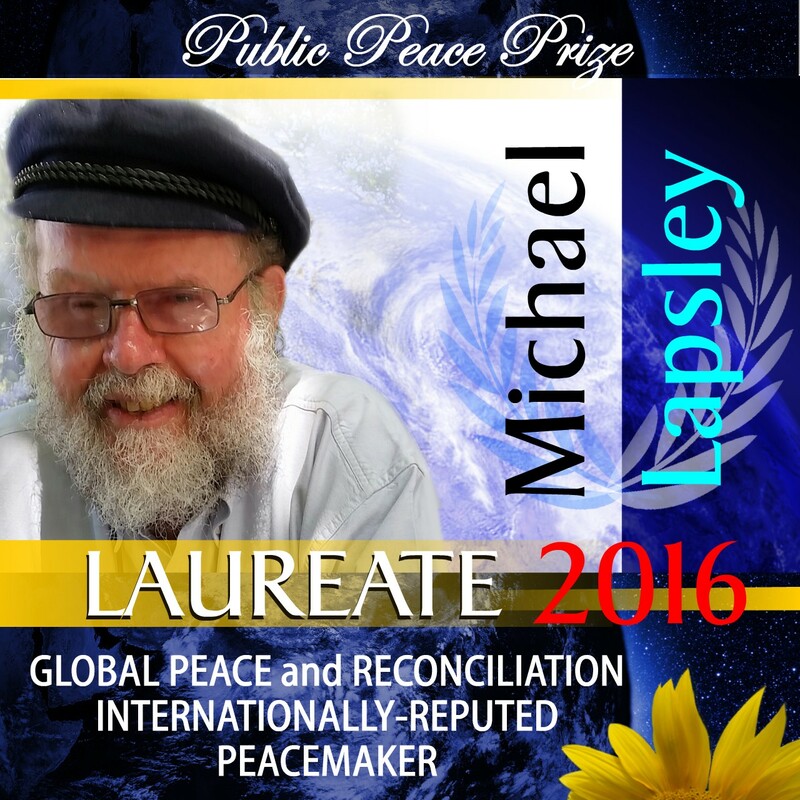 I heartily endorse Michael Lapsley for the 2016 Public Peace Prize. He embodies the struggle for peace, reconciliation, and equality. With his outstanding work Father Lapsley inspired us ever since we met him for the very first time. Healing of memories is the basis for reconciliation which is the basis for peace. What a blessing Father Lapsley has been in his lifetime to our world, what an inspiration! It gives me great pleasure to highly recommend Father Michael Lapsley for the Public Peace Prize 2016. My late husband and I met Father Michael when we were working as volunteers in Botswana in the early 80’s. We had many friends in common in the anti-apartheid movement and were members of the Anglican Communion and Society of Friends (Quakers) in Gaborone, and worked with refugees from South Africa and Zimbabwe. Father Michael’s humility and love for the people he worked with was an inspiration and encouragement for us all. He touched the lives of many people and was totally committed to justice and peace. I highly support Father Michael’s nomination for this peace prize.